It is unusual for aquatic biologists to miss a big species like Barbicambarus simmonsi. The population of this crayfish appears to be very sparse, however. Individuals were usually found under the biggest rocks in the deepest parts of a stream. CHAMPAIGN, lll. - Two aquatic biologists have proven that you don't have to travel to exotic locales to search for unusual new species. They discovered a distinctive species of crayfish in Tennessee and Alabama that is at least twice the size of its competitors. Its closest genetic relative, once thought to be the only species in its genus and discovered in 1884 about 130 miles away in Kentucky, can grow almost as big as a lobster. 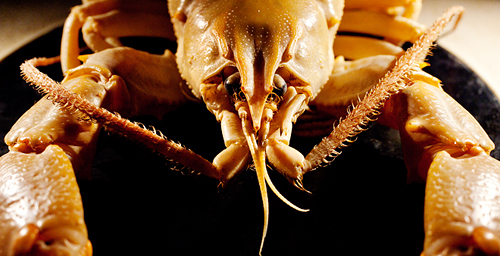 "If you were an aquatic biologist and you had seen this thing, you would have recognized it as something really, really different and you would have saved it," said Chris Taylor, the curator of crustaceans at the Illinois Natural History Survey at the University of Illinois and co-discoverer of a new crayfish species. The researchers found their first specimen under one of the biggest rocks in the deepest part of a creek that has been a (literal) stomping ground for aquatic biologists for at least half a century. The new species is described in a paper in the Proceedings of the Biological Society of Washington. 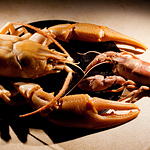 The new crayfish belongs to the genus Barbicambarus, which in addition to being big is very distinctive. 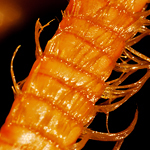 Most notably, Barbicambarus have unusual "bearded" antennae; the antennae are covered with a luxurious fringe of tiny, hair-like bristles, called setae, which enhance their sensory function. "This isn't a crayfish that someone would have picked up and just said, 'Oh, it's another crayfish,' and put it back," said University of Illinois aquatic biologist Chris Taylor, the curator of crustaceans at the Illinois Natural History Survey and a co-discoverer of the new species with Eastern Kentucky University biological sciences professor Guenter Schuster. "If you were an aquatic biologist and you had seen this thing, because of the size and the setae on the antennae, you would have recognized it as something really, really different and you would have saved it." Schuster first learned of the crayfish in 2009 when a colleague forwarded photos from a man who had seen the animal in Shoal Creek, a stream in southern Tennessee that ultimately drains into the Tennessee River. Schuster immediately recognized it as a member of the genus Barbicambarus, and sent the photos to Taylor, his longtime collaborator. Both men suspected that this was a wayward member of the originally discovered species, Barbicambarus cornutus. B. cornutus had never been seen that far south, but the researchers knew that crayfish have been moved great distances in the bait buckets of itinerant fishermen or by those interested in commercially rearing crayfishes. "I was leaning to the easiest explanation," Taylor said. "Me too," said Schuster. "That's been going on for 50 years in the U.S., moving species around, so it would not be a surprise if that was the case." 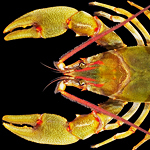 The researchers contacted a colleague in Tennessee, who told them that a scientist with the Tennessee Valley Authority, Jeffrey Simmons, had collected a crayfish that looked like the one in the photo - "just a couple of miles from where the original photograph we had gotten was taken," Schuster said. That was enough to spur a hastily organized field trip to Shoal Creek. With two other biologists, Taylor and Schuster scoured the creek for more specimens. After two hours of turning over boulders and kicking up the sediment to flush the crayfish into their seine, the researchers had found nothing out of the ordinary. "We had worked so hard and long that we were ready to give up and find another site," Schuster said. "And we saw this big flat boulder underneath a bridge and so we said, 'OK. Let's flip this rock, just for the heck of it; this will be our last one.' And sure enough, that's where we got the first specimen." It was a big male, about twice the size of any other crayfish they had seen that day. And it had the characteristic bearded setae. The researchers found only two specimens that day, a very small haul for nearly three hours of work. The second specimen, a female, was under a large, flat boulder that was too big for one man to lift alone in the current. 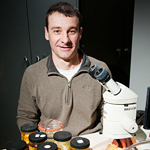 In the lab, Schuster quickly realized that the physical characteristics of the new crayfish differed in significant ways from those of B. cornutus. 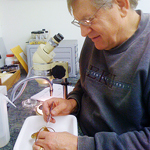 Taylor took tissue samples and compared the specimens' DNA to that of B. cornutus. "And the DNA said just what the morphology said: This thing is pretty different," Taylor said. And rare. The researchers made several more trips to the area before they were able to collect enough specimens to confirm what they already suspected: The giant crayfish of Shoal Creek was a new species. They named it Barbicambarus simmonsi, in honor of the TVA scientist who had collected the first specimen. 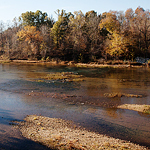 Later trips to the region confirmed that B. simmonsi was also present in the southern reaches of Shoal Creek, just north of where it drains into the Tennessee River in northwest Alabama. Most people are shocked to learn that there are about 600 species of crayfish in the world, Taylor said, with more than half of those occurring north of Mexico. Alabama and Tennessee are hotspots of crayfish diversity, he said. The discovery of a new species of crayfish in itself is not unusual, the researchers said. About two new species of crayfish are found every year in the U.S. But the discovery of a large, distinctive new species in a region that had been studied for decades is quite astounding, they said. "We looked at museum collections around the country," Taylor said. "There were no specimens in there masquerading under a different species name. No one had found this thing and called it B. cornutus. This thing had not been seen by scientific eyes until last year." The fact that a distinct species was overlooked for so long indicates that studies of species diversity in the U.S. are not getting adequate resources, Schuster said. "We spend millions of dollars every year on federal grants to send biologists to the Amazon, to Southeast Asia - all over the world looking for and studying the biodiversity of those regions," Schuster said. "But the irony is that there's very little money that is actually spent in our own country to do the same thing. And there are still lots of areas right here in the U.S. that need to be explored." Editor's note: To contact Chris Taylor, call 217- 244-2153; e-mail ctaylor@inhs.uiuc.edu. To reach Guenter Schuster, call 606-622-1016. The paper, “Monotypic No More, a Description of a New Crayfish of the Genus BarbicambarusHobbs, 1969 (Decapoda: Cambridae) From the Tennessee River Drainage Using Morphology and Molecules,” is available online.